Today I decided to give Nigel Farage a gift in honor of World AIDS Day. After all, the man has given us all so much crap in recent months, it only seemed right to return the favour. Bright and early this morning, along with other activists from ACT UP London (the AIDS Coalition to Unleash Power), I dumped half a tonne of steaming cow dung on the doorstep of UKIP’s South London office. If Farage and his party are going to keep spreading filth, then we thought they should know what b.s. really smells like. Attendance at ACTUP’s meetings has sky-rocketed ever since last month, when the UKIP leader said he wanted to ban HIV-positive migrants from coming to the UK. It wasn’t just that Farage was spewing hateful, xenophobic opinions – that’s nothing new. This time he was offering outright lies which directly harm the lives of those, like me, who are living with HIV. Trying to justify his proposed ban, Farage said that the UK ought to do what the USA and ‘virtually every other country in the world’ do. Sound reasonable? Too bad it isn’t true. Only 12% of the world’s nations (including anti-democratic regimes like Russia and North Korea) deport people with HIV. Contrary to Farage’s claims, the US is no longer one of them: President Obama repealed the HIV travel ban five years ago. On World AIDS Day, we should be proud that even during the height of early AIDS panic the UK never seriously considered such a ban. Today, the UK has an admirable commitment to making HIV treatment freely available to everyone who needs it, because our public health officials recognise that getting everyone tested and getting those with the virus onto treatment is the best way to curb the epidemic. According to Farage, ‘We cannot afford to have people with life-threatening diseases’ coming into the UK. In fact, though, in the UK today HIV is very much a homegrown problem. Figures from Public Health England show that the percentage of new diagnoses among those who were born in Africa has dramatically decreased. The epidemic is not being fueled by migration but by shame, fear, and stigma that make people afraid to get tested or to disclose their status. 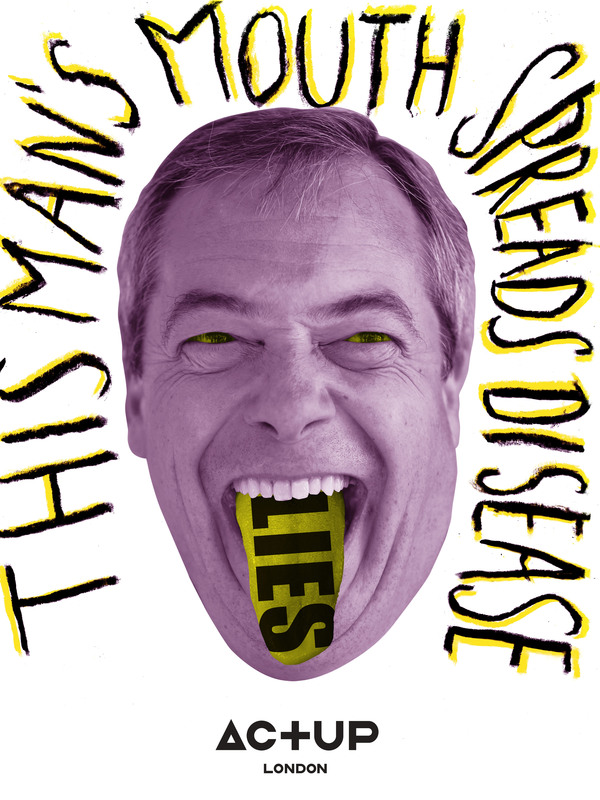 If Nigel Farage actually consulted with public health officials, he’d know that HIV is not a ‘life-threatening disease’ any more, and he’d stop spreading fear and lies about it. When treated, HIV-positive people have normal life spans and the latest studies indicate that it is nearly impossible for them to transmit the virus to their partners. This is the message that we need to be spreading, so that people can make informed, responsible choices – not the outdated misinformation that Farage sends out. Today, in honor of all those living with HIV, my colleagues and I decided we’d had enough of UKIP’s crap and we wanted to give it back to them for a change. Why hasn’t anyone in power been bold enough to call out Farage for his dangerous misinformation? Despite the outsized media platform given to them, we know that UKIP’s poisonous views are not in line with the majority of the British people. We are part of a growing coalition of community groups opposed to UKIP’s right-wing rhetoric and ready to challenge them all the way to the general election. With the established political parties running scared, we urge all of those who have been targeted by UKIP to join us in rejecting his crap. Something stinks in Britain right now, but it hasn’t come from abroad, it’s coming straight out of Farage’s mouth. Next Post PrEP WORKS. WE NEED IT NOW.